Sepia-toned image of a Sepia-toned image of a small wooden building with a classical facade and false front. Three Doric style columns hold up a rectangular pediment with false columns etched along beneath its top. A square false front rises above the top of the pediment. The banks sits on a street corner with an empty lot next door, and a wooden boardwalk runs in front of and beside the building, separating it from a small grassy verge and an unpaved road. 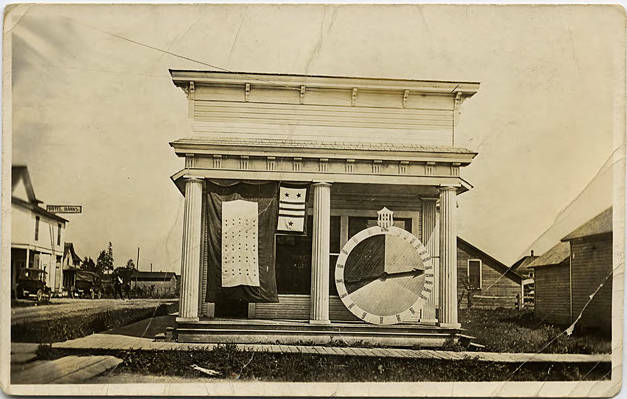 The front of the bank is obscured by two banners and a large wheel. The wheel is divided into thirds, with hands to measure the number of bonds sold or money raised. A number of antique automobiles can be seen on the street behind the bank. 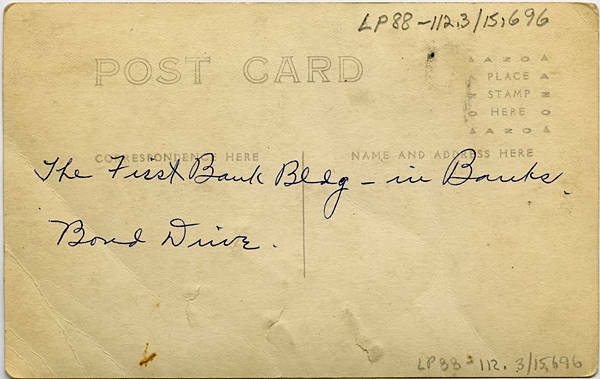 Liberty bonds were sold by the United States government in order to finance World War I, and purchasing them was seen as a patriotic duty. [back] [pen] The first Bank Bldg - In Banks. Bond Drive.